In brisk trading on Thursday in New York, Comex copper enjoyed its 11th straight session of gains touching a two-month high of $3.2185 a pound ($7,095 per tonne). Copper is up nearly 27% in 2017 as it continues to recover from six-year lows struck early last year and expectations are for a positive if more modest performance next year. Despite up to 38 unions scheduled for wage negotiations in the next year, supply disruptions maybe avoided with rapid signing of new contracts. Chilean miner Antofagasta Plc announced a new wage agreement with unionised workers at its Centinela mine, defusing the risk of a strike amid a volatile labour landscape across the world’s copper-producing nation. According to latest assessment conducted by International Copper Study Group, stagnant copper refined copper supplies, in combination with strong Chinese apparent usage in September, conspired to lift the deficit from an estimated 160 000t for first 7 months of the year. Estimates that global mine output has slowed 2.5% in the period end to September, as Chile, world’s most prolific copper producer saw a 4% decline in output. 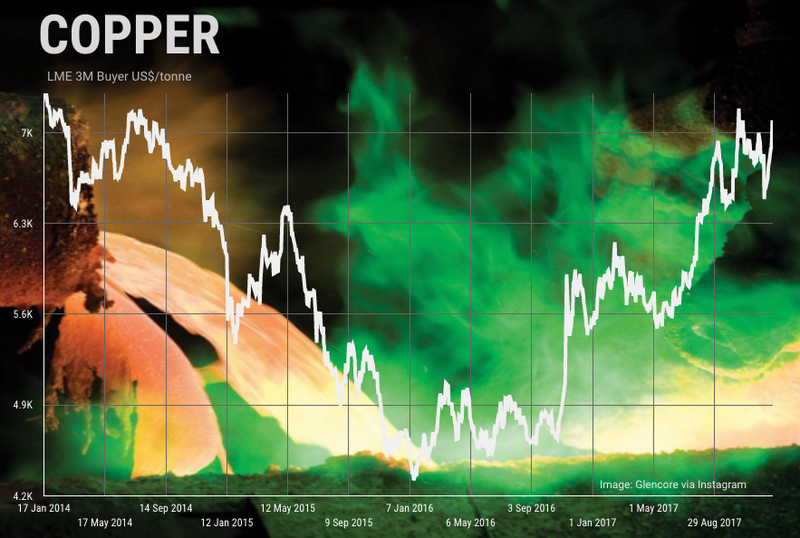 It's not just supply side issues – especially at mine level – that's boosting copper's prospects. Demand from China is holding up with the country's refined copper production in November jumping nearly 10% from the same time last year to 786,000 tonnes, the highest rate in at least three years data from the National Bureau of Statistics showed Monday as smelters make the most of higher copper prices. For the January – November period this year production is up 6.8% and 2017 should comfortably outpace last year's total of 8.44m tonnes of refined copper production. China's smelters working at capacity helps to explain the decline in imports of refined metal and still growing concentrate imports. Shipments of copper concentrate in October increased slightly from last year to total 1.78m tonnes in November, a new monthly record and up nearly 30% from October's disappointing figure. Year to date Chinese concentrate imports are up moderately from last year's record 17m tonnes.